It’s been a couple of weeks — I was traveling last weekend. And I missed the last of the blackberries. This makes me sadder than you can imagine. I consoled myself by buying really deep purple, shiny plums. They’re California plums and probably not organic, but I really want to relive that taste from my childhood. I’m planning on roasting these (I can’t eat them raw) like I did with some locally grown plums a couple of weeks ago. Those just didn’t taste like the ones I remember — they were a smaller, tarter variety. They weren’t bad, just different. 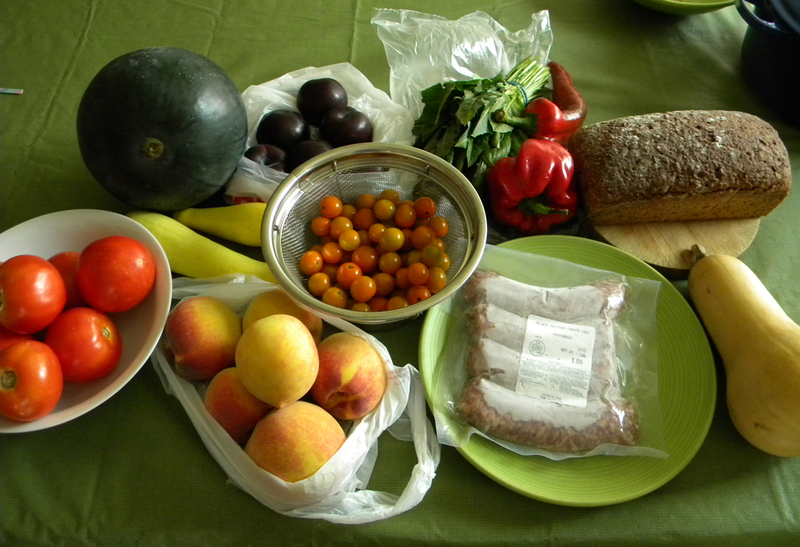 All of this weighed a lot and I walked to the market today because it’s so nice and cool. I’m contemplating a run to the Amish market for ground turkey to make more breakfast sausage. Also, I forgot to buy cheese at the open-air market, so I may buy some there. All that’s left in the VegTrug are the chives, basil and rosemary and a couple sad-looking carrots and onions. I think the onions are done and I’m tempted to pull them to see how they turned out. The carrots, I’m hoping, will bounce back when the weather cools. 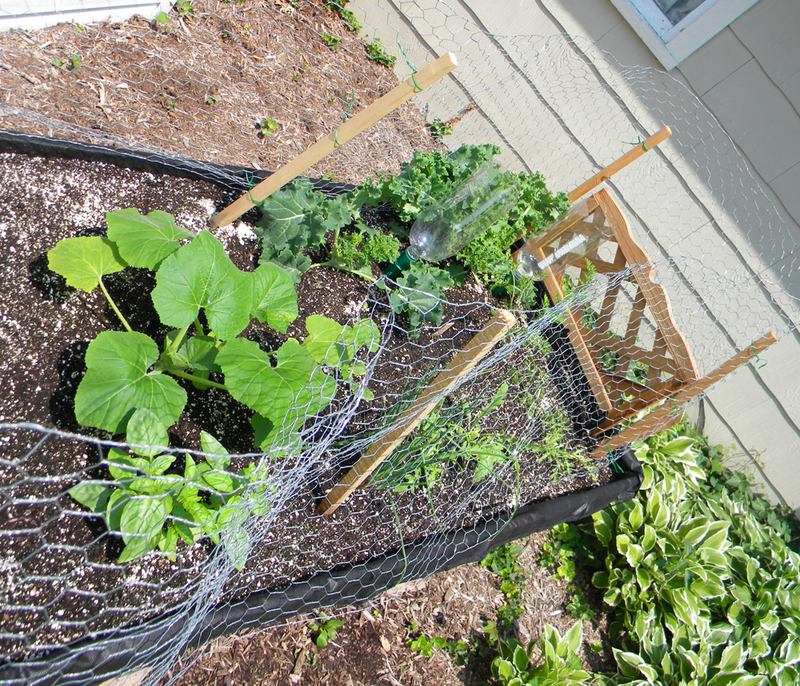 My kale is finally fading so I’m going to pull it out and plant new (I keep saying that — I really mean to do it). I’d really let the weeds go around the VegTrug and so spent some time pulling weeds around that part of the garden last night. I’ve learned that piling the pulled weeds on top of other weeds smothers the underlying weeds while the pulled weeds compost themselves. I’m trying that around the VegTrug. The stinkbugs are still decimating my pumpkin plant. No pumpkins from my garden this year, I’m afraid. I still have the trap out there and it has caught a few. In speaking with a friend, what I really should have done early on was pull all the ones I found and dunk them in a bowl of soapy water to kill them and keep them from procreating. I’m doing that now with the ones that are big enough for me to catch, but there are so many tiny baby ones, it’s kind of a fruitless endeavor. My tomato plants also are done and I started trimming them back in preparation for pulling them out and taking down that container and cage. 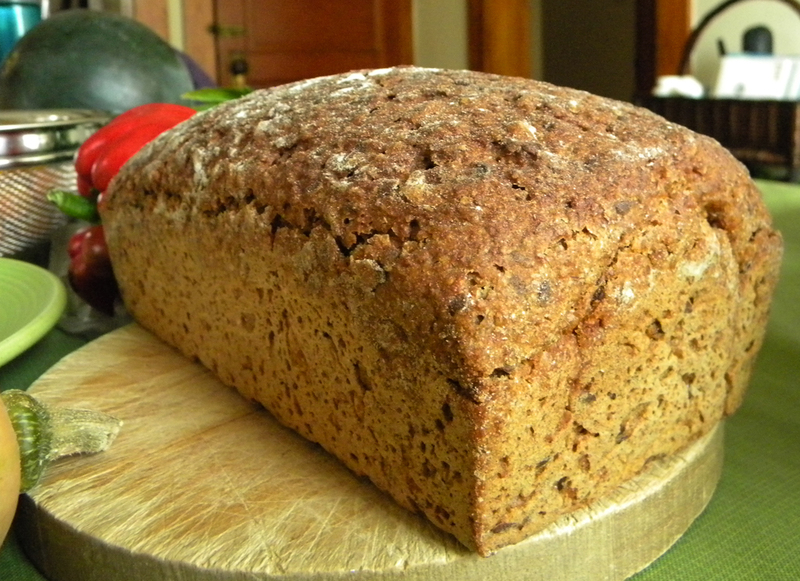 Well, I tried the rye bread that I bought today and that seems to be working out okay. I tried chocolate yesterday and no reaction to that either. Yes! I have been thoroughly enjoying the return of dairy to my life. Still staying away from wheat, but I’m getting by with corn-based products. So happy to be able to eat the crunchy tacos at Chipotle when I go there. Posted in Baked Goods, Diet, Food, Fruit, Grow Your Own, Local, Meat, Vegetable and tagged Amish, blackberries, bread, butternut squash, cheese, food, gardening, kale, onions, peppers, pumpkin, sausage, sustainability, tomatoes. Bookmark the permalink. O. M. G. Fresh rosemary feta. That is all. Well, not really, I was quite loaded down when I left the open-air market today, but I was most excited about the fresh feta from Chapel Country Creamery. They had samples out and were selling quite a lot of it. I’ve been harvesting tons of kale and had to cut back the original arugula plant, which had bolted. The two younger ones are still producing small, tender leaves. The zucchini plants I transplanted last week seem to be bouncing back. I finally thinned out that squash plant with yellow leaves — the other two were gargantuan in comparison. I planted the pepper and chives that I bought today and watered everything thoroughly since it’s going to be so hot the next few days. I also tried direct seeding some parsnip seeds today — the only surviving seedling bit the dust this week. I think some of the originally planted spinach seeds finally germinated. It will take a few more days to see if it was just a weed invading their pot instead. 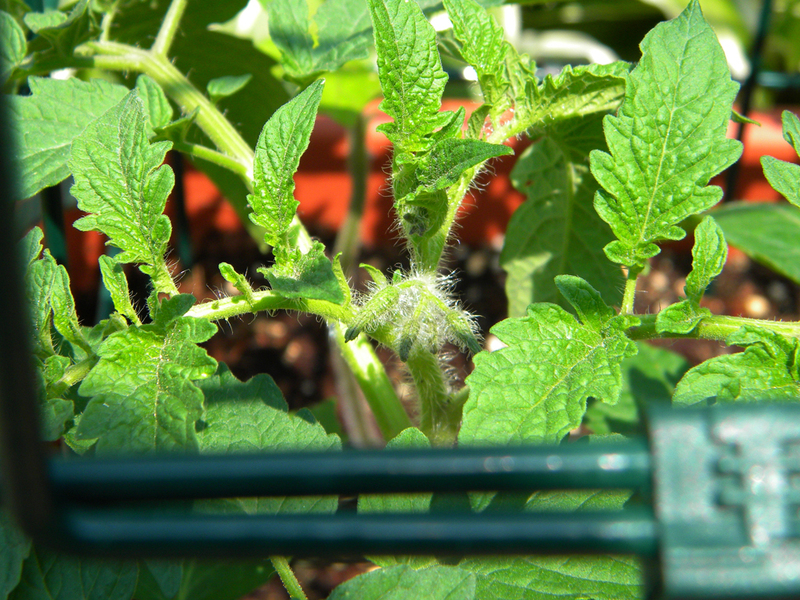 The tomato plants I bought last week are doing well and the cherry tomato plant already has buds on it! Posted in Baked Goods, Dairy, Food, Grow Your Own, Sustainability, Vegetable and tagged arugula, bread, cheese, chives, feta, food, gardening, kale, peppers, squash, sustainability, tomatoes, zucchini. Bookmark the permalink. 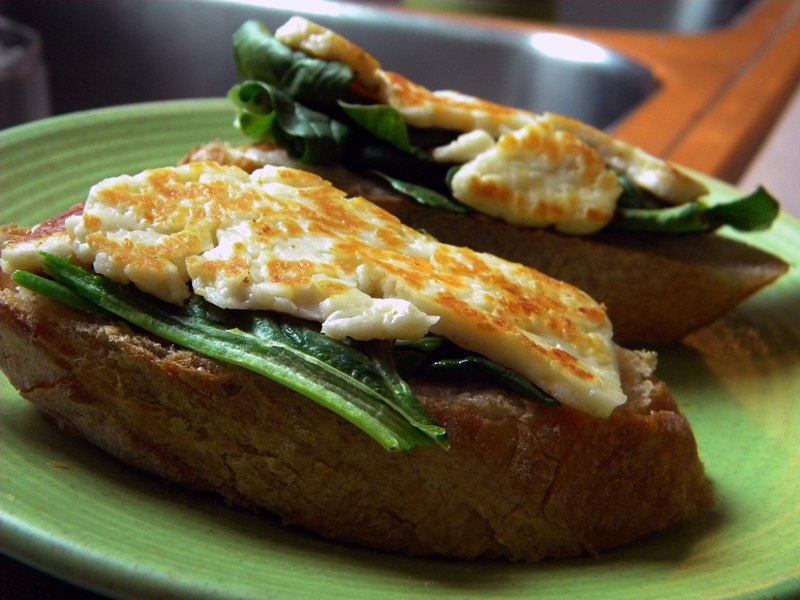 I have some halloumi cheese and spinach leftover, so I went searching for recipes. I didn’t want to grill the cheese again because it was so hard to clean the pan. I found this recipe for Fried Halloumi Cheese Toast. Sold! I fried the cheese slices for a few minutes on each side until they were golden. Then, I placed the cheese on piles of spinach, which I put back in the hot pan, to wilt the spinach a bit. 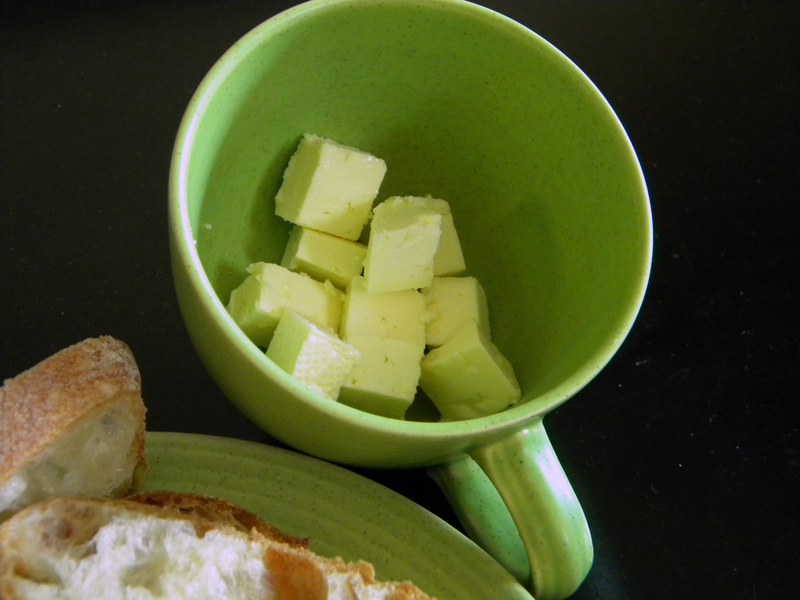 Once that was done, I placed each pile onto a slice of baguette I thawed in the toaster oven. So good! I could eat fried halloumi for breakfast, lunch, and dinner. Posted in Brunch, Cooking, Dairy, Food, Leftovers, Recipes, Snack and tagged bread, bruschetta, cheese, cooking, food, halloumi, spinach. Bookmark the permalink. I’ve been making these since I was a kid. Whenever my mom made spaghetti, she usually served it with garlic bread — I’d save the bread until I was done eating my spaghetti and scoop any remaining sauce on my plate onto the bread. I think my cousin Lee showed me how to do this when we were 5 or 6. Now, if I make spaghetti sauce and have some leftover (but not enough to boil more spaghetti), I turn it into pizza sauce instead. For what you see pictured, I didn’t make full-on garlic bread. I’m too tired for that on a weeknight. 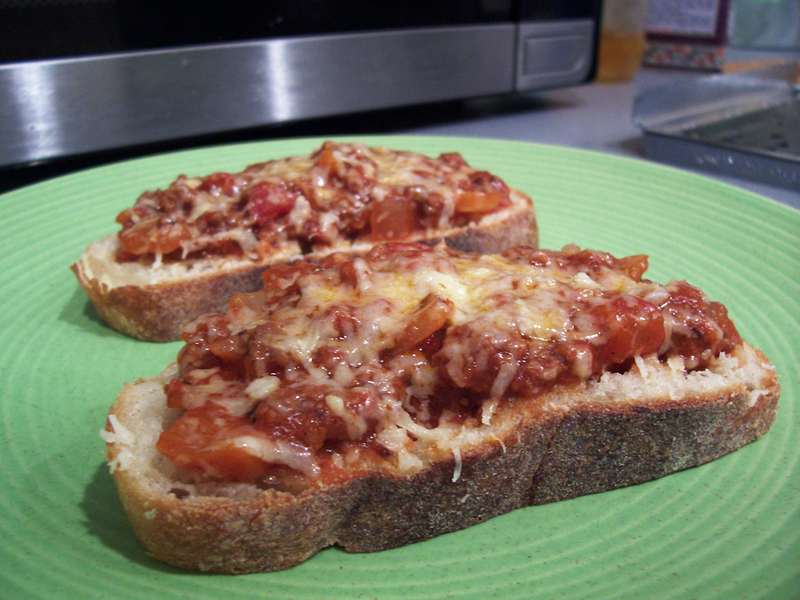 Instead, I pulled out two frozen slices of country French bread and toasted them to thaw them out/crisp them up. Then, I rubbed each slice with half of a garlic clove, spooned on the spaghetti sauce (heated up in the microwave), shredded some Parm over top and broiled them until the sauce was nice and hot and the cheese melted. Posted in Cooking, Dinner, Food, Leftovers, Recipes and tagged bread, cheese, cooking, food, spaghetti. Bookmark the permalink. This sandwich incorporates leftovers from my roast beef* dinner the other night and a cheese platter I put together for New Year’s Eve. The cheese I used was a substitute for camembert whose name escapes me. 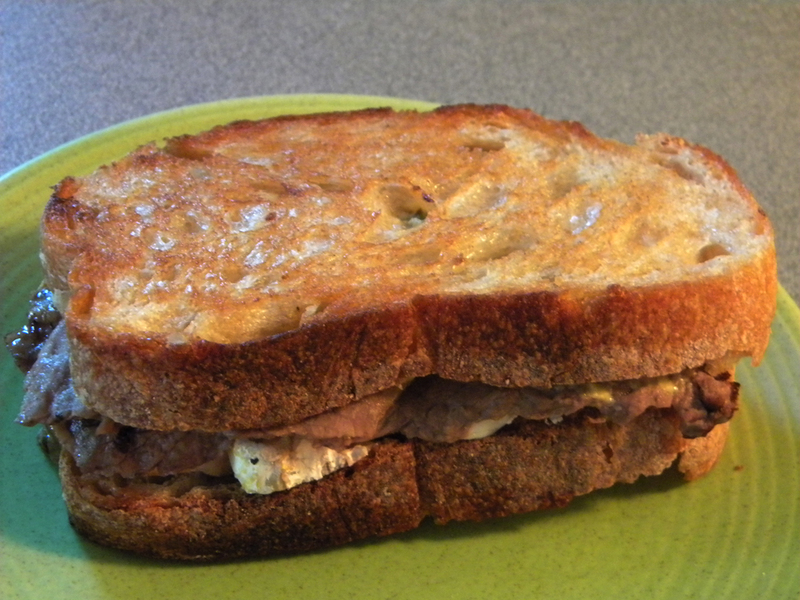 It was pretty mild on its own, but really paired well with the meat on this sandwich, which also featured basil dijon mustard and Vermont sourdough bread. Posted in Cooking, Food, Leftovers, Lunch, Meat, Sandwich and tagged bison, bread, cheese, grilled cheese. Bookmark the permalink. 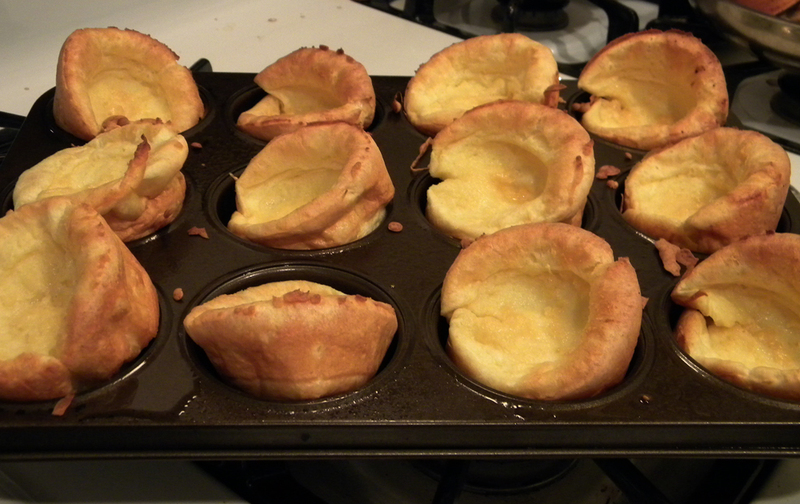 How have I not made or eaten Yorkshire pudding until now? Today, I roasted an eye of round piece of bison in the oven. I set the oven to 375 and roasted it for 30 minutes, then checked it every 15-20 minutes until a meat thermometer inserted read 125-130. 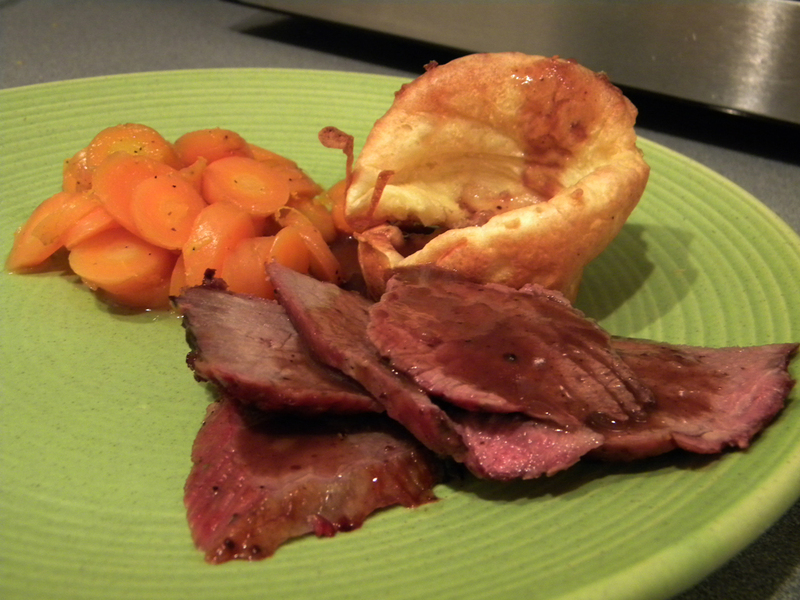 Then I let it sit while I prepared gravy, Yorkshire pudding, honey-glazed carrots and spicy garlic mushrooms. I referred to several recipes for Yorkshire pudding, including that in Nigella Lawson’s Feast, The Unofficial Harry Potter Cookbook and at Closet Cooking (I also used his guidelines for gravy here). Not shown below are the mushrooms, which I did remember to add to my plate before digging in. I forget where I originally found the recipe for these, but I basically tossed 6 large, sliced mushrooms in sauteed minced garlic (one large clove) in olive oil and threw in about 1/4 tsp crushed red pepper. I let them cook down while I made everything else. I have to say that this was the first time I cooked bison and it didn’t taste like its cow-sourced counterpart. Not sure if it was the cut or not. Not that it tastes bad, just different from the roast beef I grew up eating. Posted in Cooking, Dinner, Food, Meat, Recipes, Side and tagged bison, bread, carrots, cooking, food, mushrooms. Bookmark the permalink. 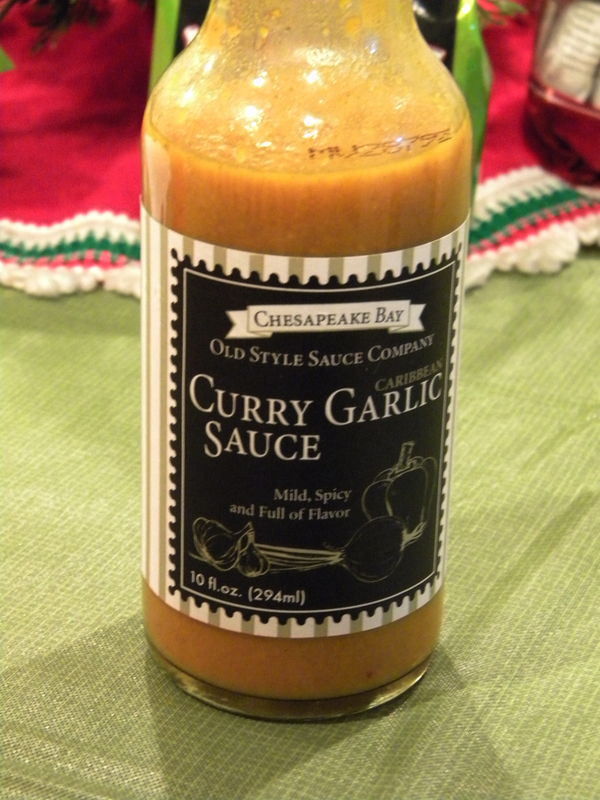 A couple of weeks ago, I picked up a bottle of Curry Garlic Sauce made by Chesapeake Bay Old Style Sauce Company. 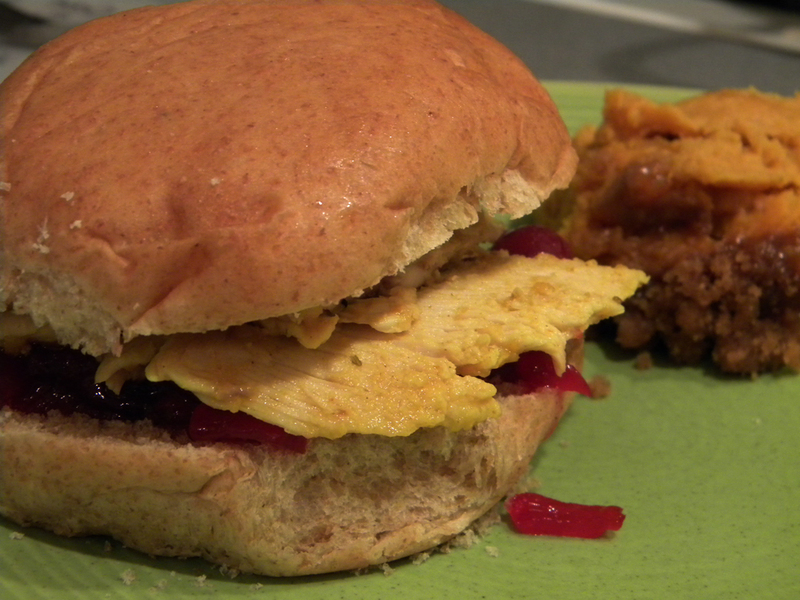 One of the first things I wanted to try it with was the turkey leftovers after Christmas dinner. I also had some leftover brandied peaches and cranberry sauce. I decided to mix the curry sauce, turkey and peaches together and see what happened. The result is pretty good. I had it on a sandwich roll using the cranberry sauce as a condiment. I ate the sandwich with some leftover Sweet Potato Crunch. I probably won’t combine the curried turkey with the cranberry sauce again — the flavors were competing with each other too much. I have a pint of the turkey mixture leftover and I am freezing it for use later — I may try and make it into a rice dish. I also have a frozen pint of the cranberry sauce and I want to find new uses for that too. Posted in Cooking, Dinner, Food, Freezer, Local, Meat, Recipes, Sandwich and tagged bread, cooking, cranberry sauce, curry, food, freezer, sandwich, sweet potatoes, turkey. Bookmark the permalink.